Anyone watching Campbell Live last night would have been treated to the police reassuring us that their decision to impose a 'no tolerance' approach to speeding over the Queen's Birthday weekend is all and only about road safety. Campbell ran a simultaneous poll asking the audience whether they thought it was for safety or revenue gathering. Revenue gathering attracted an 81 percent response. 4 in 5 people listening didn't believe the talking head. Police have already imposed a 'no tolerance' approach around schools. Yesterday I heard a number of people calling talkback who had received recent speed camera tickets for going 53 - 54 kmph in a 50 km zone. Two were in school vicinity BUT outside term time. One arrived in my letterbox last week for going 56kmph in Days Bay. The notice described the location as near Wellesley College. But the photo was taken at 9.45am and anyone that knows Days Bay knows the school is set a long way back from the road with the sea on the other side. It is unusual for the pupils to be anywhere near where the camera operates, especially in class time. Now I wouldn't be opposed to speed limits being lowered around schools during periods of activity and by all means police it (as well as the drivers of 4WDs that double park to pick up precious in the rain insanely blocking the movement and vision of other motorists and children). But the speed camera operators are exploiting the 'no tolerance' around schools simply to ping more people and gather more revenue. And when they try to tell us they are not, we get a little bit madder. There is a location at the western end of the Petone Esplanade where routinely, on Sunday mornings, a bunch of cops hide behind a building, jump out with their radar and then slightly further along, haul in offenders, speed criminals. Grey-haired Sunday drivers who thought they were in a 70 kmph zone, being industrial, when in fact it is a 50 kmph zone. More than a few hefty fines will have been gathered from that little goldmine. Yesterday I was up flying. It is very easy to become over-fixated on instruments when performing particular manoeuvres and watching height, airspeed, angle of bank and balance, all of which are meant to stay at prescribed values. The trick is to get these right as well as maintaining ongoing visual and aural vigilance. Drivers obsessing about whether their speedometers are reading 100 or less (or to allow for any inaccurate calibration, 95 or less) have their heads inside the car and not outside. And it wouldn't surprise me if psychologically they are in a worse frame of mind for driving than when the 'no tolerance' isn't being preached at them. But back to the police and their constant road safety refrain.It reminds me of a piece I was reading earlier this morning about how language is used to achieve certain ends. And so it is with the police, telling us that their actions are all about saving lives. Yet most of us are sitting there saying, How bloody stupid do you think we are? It is not a state of affairs conducive to achieving anything positive. An unbelievable story coming out of the UK. Unbelievable? I wish it was unbelievable. That is, so far-fetched, it couldn't be true. A taxi driver who has never shown a hint of trouble or anti-social behaviour in the past has driven around Cumbria (where I spent many childhood holidays) shooting at people from his car. 12 are believed dead and many more badly injured. I suppose it could enter your mind, get categorised as another mad man on a massacre, and forgotten about, but reading the details coming out, it really is horrific and deeply, deeply disturbing. How the people who lost friends and family, who witnessed the carnage, are going to recover... well, some just won't. As I said, unbelievable. I talk a lot about how increasing benefit levels will draw more people onto welfare (see previous post). Yesterday I came across the following which essentially tells us that for every 1 percent increase in welfare there is a 1 percent increase in joblessness. That is, in English speaking countries. But the same relationship in the Nordic countries is a negative one. Hence the futility of trying to emulate policies from that part of the world. Better off if we "talk calmly"
Economist Susan St John had an article published in my local paper, the Hutt News. It advocated her usual answer to child poverty so I submitted my usual response. Economist Susan St John writes (Hutt News, May 11) that the In Work tax credit, "...manages to exclude the poorest children, in families on benefits, whose poverty has simply been left to deepen." Benefits are annually adjusted accounting for cost of living rises and family support payments were also increased when the In Work tax credit was introduced. Children in beneficiary families - the vast majority have mothers on the DPB - have not been completely ignored. St John, spokesperson for the Child Poverty Action Group, has already led a legal challenge to the government on the basis that this tax credit discriminates (presumably with the aim of having it extended to beneficiary families). The Human Rights Tribunal found that while it is discriminatory, the government has a right to discriminate between those who work and those who do not when forming social policy aimed at lifting employment and income. If the In Work tax credit is extended to non-working families the incentive to work will be further eroded. While children can and do suffer from material need, they also suffer from the non-material deprivation that goes with having no dad; lacking the structure, routine and example a working parent provides; and from exposure to the kind of dysfunctional habits not working allows. Making the DPB more economically attractive, which is what Susan St John essentially advocates, will only result in more parents and children being drawn onto it long-term. This brought forth three letters which when read together provide a fair bit of irony. 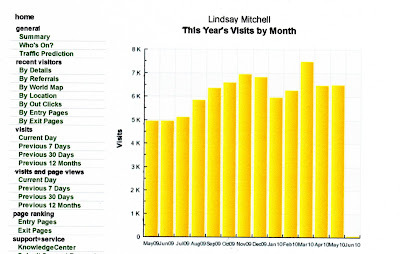 I am pleased my stats have held up (compared to a year ago) because my output has dropped off lately. Frantically busy with work and other stuff but always with a thought or three to share. 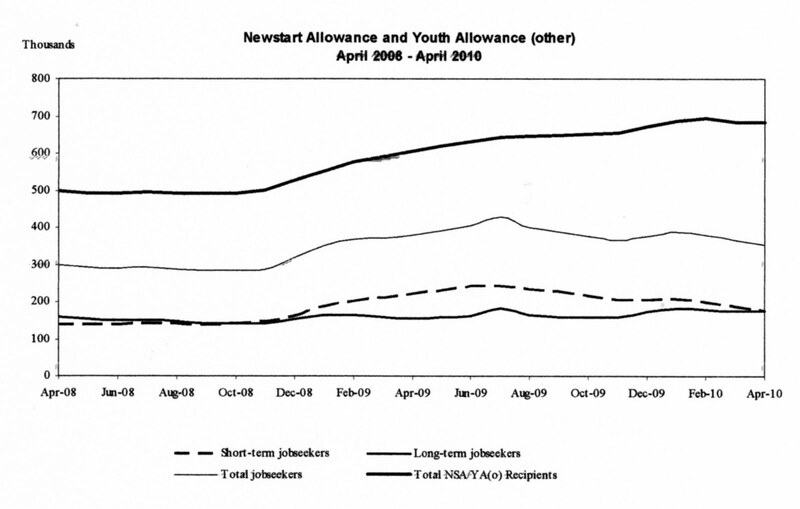 These are the April 2008 to April 2010 Australian unemployment benefit statistics. 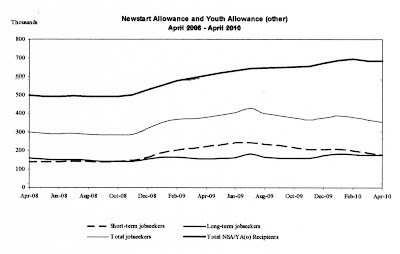 595,458 people are receiving some form of 'Newstart Allowance'. 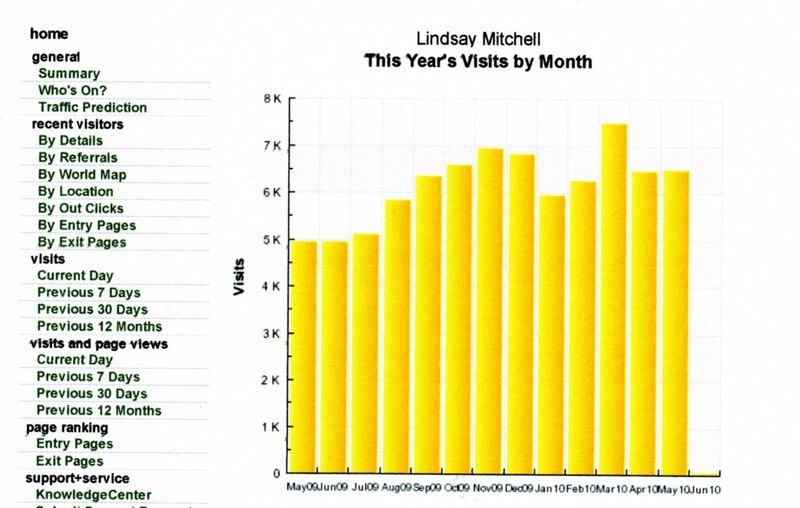 In NZ in March there were 60,211 on the unemployment benefit. Interestingly where our male/female ratio is 71/29 percent the Australian ration is 61/39. Part of the reason for this big difference is single parents with children 8 or older are now put on the unemployment benefit. If we did that here the same effect would be observed. The current unemployment rate in Australia is 5.3 percent. Here it is 6 percent. Its a natural reaction to scrutinise a claim based on our own experience. One-sided teaching of our history has left New Zealanders ill-equipped to understand the feelings of Maori, the head of Victoria University's School of Maori Studies said yesterday. Of Maori, and Maori history, I was taught very little. At primary level I remember learning about waka and whares and going to see such things at the museum. We made those stick things out of newspapers and pois and sang Maori songs, which I particularly enjoyed. By the time we were nominating our subjects I had enough interest in history to chose it in the fifth and sixth form. My memory can dredge up extensive teaching about apartheid in South Africa, the origins of the first and second world wars, the introduction of the old age pension, feminism and women's suffrage - but nought about Maori. And to this day I still feel my knowledge of Maori history is sketchy - but it's a great deal better than many others. Things I have taught myself about are the first Maori Party, the paucity of public health services to Maori, the physical separation of the races due to geography and how that changed, the role Maori played in the World Wars (which varied between tribes) and their lack of recognition for it, the actual discrimination against Maori in the granting of old age pensions, the role that missionaries played in Maori education, the cooperative interaction between the Maori and early settlers which enabled the settlers to survive, the fascinating history of Ngati Porou and Apirana's efforts to reform land ownership to Maori advantage (consolidate title to allow for development), the development of the Ratana movement, the ethos behind Parihaka before it was destroyed by the government, what was behind the establishment of Maori 'royalty' and how the royalty isn't universally recognised by Maori, how difficult it was for Maori to get into a hospital, how devastating the introduction of diseases they had no immunity against was, how Pakeha were indifferent to Maori need during the depression because they considered them able to survive off the land, how Maori had their own hierarchical system and treated their weakest quite abominably, how storekeepers ripped off Maori pensions, the barring of Maori from pubs, the institutions of whangai and customary marriage, the acceptance verging on embrace of paternalistic leadership. I could go on. But the result of learning about Maori history is, I have developed a sympathy for their disadvantage and a appreciation of our differing world-views. That doesn't mean I go for the victimhood approach. But it does leave me with a slightly different mindset to many other Pakeha. With the Tuhoe business, for instance, I was out on a limb. So the upshot of my rambling is, yes, I agree with Peter Adds. Mental illness - new hope? Not often enough do we see an idea or invention that has the potential to solve contemporary problems. This might be one however given that most of the growth in invalid's and sickness benefits is from psychological and psychiatric conditions which the health system does not seem to have the capacity to treat.